So, you have a dozen social media accounts, but do you know how to use them well? Social media networks are a great place to connect with friends, family, and even network with other people in your industry. In order to make the best use of social media that you can, you need to be smart about how and what you post. Some social media networks make it easier to have only one account. On Pinterest, for example, you can make separate boards and people can follow the boards they like and ignore the ones they don’t. On Twitter, you have one feed, so you have to be careful about what you post. 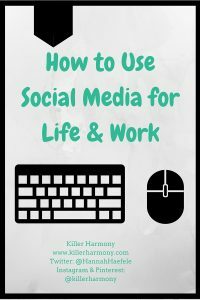 Today, I am going to share with you what I have learned from using social media both for personal and professional reasons. Most likely, you have a few social media accounts that you use for personal stuff. These accounts are where you connect with friends and family and keep them updated. 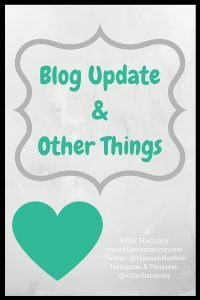 You might post an update every now and then about professional (such as blog or business) related things that seem relevant. I use Facebook primarily as a personal social network. Most of my friends and family members have a Facebook account, so I can post updates about my life and more personal things in general there. Facebook is my oldest social media account, but I still keep up with it so that I can stay updated on what my friends and family are doing. I have recently been getting into Snapchat, and I post pretty regularly on there now. I love using it to post funny things that happen throughout my day that don’t necessarily warrant a whole post on Facebook. I can be a bit more personal, but I still try to remain professional, since I do have a public account. Unless you have a business or are working for a business where you need to manage a professional social media account, you probably don’t think all that much about using social media for professional reasons. You totally should, though. Social media is an important part to networking, especially if you want to have a career in the online world. Yes, I also use Facebook for professional stuff, but in a different way. I have my own Facebook page for my blog and business, which I tend to neglect, but I need to work on updating it more. It is the page where I have the least following, so I need to build that following first. I also love Facebook groups. They are a great place to ask questions about things related to blogging and business, and just questions about your industry in general. Finding Facebook groups that you like is a good idea if you want to learn a lot and get more involved in your industry. I mostly use Instagram for professional promotion, but I am more personable there than I am on my blog. I don’t really post a ton of personal pictures, but every once in awhile, you can find one. I used to use Instagram as a personal account, but I don’t know a ton of people in my life who use it, so I found that it wasn’t really benefiting me in that way. For my blog, I post behind the scenes pictures as well as a few day in the life things when I see fit. You might think I’m a little crazy for sharing a social media account for my life and biz, but I think that it can work if you do it well. I do post some personal updates on Twitter, because I know a decent number of my friends are on there, but I also like to post blog and business updates, too. I have a public account, so anyone can follow me. For this reason, I try to keep my location pretty private, but I will post tweets regarding my university (very occasionally). I also like participating in Twitter chats. It is a great way to get your name out there, plus like Facebook groups, it is a great way to connect with people and get questions answered! Pinterest is literally a blogger’s best friend. Do not neglect Pinterest if you are a blogger. 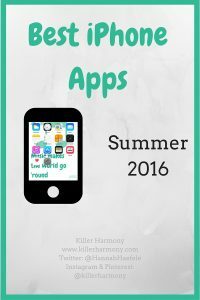 I started out, as with most other social media, using Pinterest for myself and the few friends on there. Now, I use it to promote my blog and biz, too! In order to clear up my account, I did make some of my out-of-niche (non college, blog, or otherwise related) boards private. I can still see them, but you will not be able to see these boards if you go to my profile. So, what does this mean? Social media is a great thing, but you need to be smart when using it. I know some bloggers prefer to make separate accounts for their blogs so that their personal friends don’t get too annoyed. I understand this, and maybe I will make separate accounts in the future, but right now, I see no need. I love being personable on social media, because I can show people that I am a real person. I am not just some random blog post that you may come across. Before starting this post, I want to make a disclaimer that I do not have a disability. I’m merely writing this post to share with you all my thoughts on the book and the trailers and previews of the movie. I am in no way trying to dehumanize people with any type of disability. 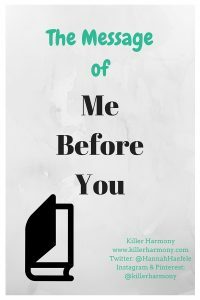 So, you have probably heard of the newest book-turned-movie “Me Before You.” The book was written by the British author, Jojo Moyes. Since hearing about the movie adaptation, I decided to read the book, as books always tend to be better than their movie counterpart. In case you don’t know much about the story, it focuses on William Traynor, a 35-year-old man who was injured in an accident with a motorcyclist two years prior and 26-year-old Louisa Clark, his new abled bodied care giver. The book and movie has received a ton of criticism from members of the disabled community for many reasons. The first is that they chose an abled bodied actor, Sam Claflin (Finnick Odair in The Hunger Games) to portray Will. I, of course, see the problems with that as it does show a bit of ableism. However, Rachelle Friedman, a woman in a near-identical case to Will, understands the choice to choose an abled bodied actor for reasons based on time and energy required of the role. I do understand that there is a lot of misrepresentation and lack of representation of minority groups in Hollywood and the media. I do not think that is right, but in some cases, like this, it makes sense. It takes time to dress, undress, and redress people with quadriplegia. Related health complications might affect the filming schedule. Read more on Rachelle’s thoughts here. The other big reason that the book/film has received criticism is because of the ending *SPOILER ALERT* when Will commits assisted suicide. Some disabled people and activists for the disabled have come out and said that the message of the story is that it shows that disabled lives aren’t lives worth living. I would like to ask some of these people if they have read the book and/or seen the movie. While Will’s assisted suicide is a major part in the story, I do not think it is the main part. Yes, Will was injured in an accident and yes, he must now live in a wheelchair and rely on constant care from others. I did not get the feeling of it being about how disabled people must commit suicide. Rather, I think the main message that the book and movie tells is that life is worth living, regardless of your situation. You can make the best of what you’ve got if you just look at all of your options. So, you want to make some money online, and you think that filling out surveys might be a good choice. I’ve done it, and I think a lot of people who want to work from home try survey sites at one point or another, and I want to tell you to not waste your time. Surveys take time to fill out, even if it’s only five or ten minutes, that’s still something. And for a survey that will only pay 50 cents maybe a dollar if you’re lucky, that’s not a good wage. Over this past winter break, I tried to make money from survey sites. I signed up for Opinion Outpost and Swagbucks which are the two biggest sites that I know of. It seemed like a good deal at first. I could make some easy cash doing stuff that I already knew about. People would PAY me to give my opinion! The thing about these sites is that they make it seem so easy. They tell you that you will probably qualify for quite a few surveys and that you can earn a decent amount of money. Well, that is true…for like the first hour of using the site. After I joined these sites, I qualified for quite a few surveys, and I continued to get emails about surveys I qualified for, but the thing is, I would get booted out of surveys despite “qualifying” for them. Not cool. This happened when there were already enough people from my demographic who took the survey, which is fine. Just tell me that before I fill out an entire survey only to not get paid for it. I was wasting my precious time attempting to make just a little bit of money trying to find a survey I would qualify for. And the thing is, there was always a limit on the surveys that I could do at one time. It seemed like I was constantly hitting the limit. I did manage to make enough money to cash out on Opinion Outpost, but not enough for Swagbucks. These survey sites seem to be more catered to stay at home moms, or at least the surveys I was given. They had questions about home ownership, cleaning products, cars, family stuff. Nothing really related to millennials. That’s fine, as I would rather make more money with my time. Personally, I value my time much higher than $3-6 an hour which is what you might make if you qualified for ever survey you did. If you are a stay at home parent or need some extra money, surveys would be a great choice, but as I work towards starting a business and career, I have to know how much I value my time. I value an hour at least triple what surveys would pay…if not more. Please don’t under value yourself or your time. The internet is filled with ways to make money, more than what survey sites pay. I can’t recommend survey sites as a money maker, because they aren’t. You can make some easy money for a nice weekly treat, but it is not enough to consider it a job. It’s a lot more work than what it’s worth. Don’t waste your time. If you do want to make money online, there are better ways to do it. 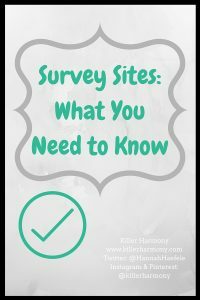 Have you tried survey sites before? Tell me your experience in the comments or on Twitter at @HannahHaefele.